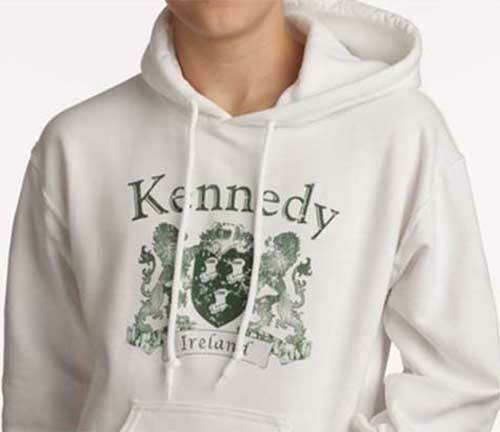 This Irish coat of arms hoodie is a white color pull over sweatshirt with pockets that features a 50/50 Cotton/Poly blend. The Irish coat of arms is an imprinted retro heraldic design on the chest of the sweatshirt that is enhanced with a lined hood and you may select from over 900 names. The Irish coat of arms sweatshirt is a special order item from The Irish Gift House that ships directly to you or to the gift recipient from our supplier; please allow 2 weeks for delivery.